Some members of Manitoba’s NDP government have been on the hot seat lately over the rising cost of Manitoba Hydro’s Bipole III project (see here) — essentially who knew what and when. Members of the Opposition have alleged the NDP was in contempt of the legislature because the old Bipole cost figure was oft-repeated in the house as being considerably less than what it is. Following the daily prayer on April 15th of 2011, the honourable Official Opposition House Leader (Mrs. Taillieu) rose on a matter of privilege to contend that comments made by the honourable Minister of Finance (Ms. Wowchuk) and the honourable First Minister concerning the projected costs for building Bipole III were at odds with information from Manitoba Hydro and were deliberately misleading. 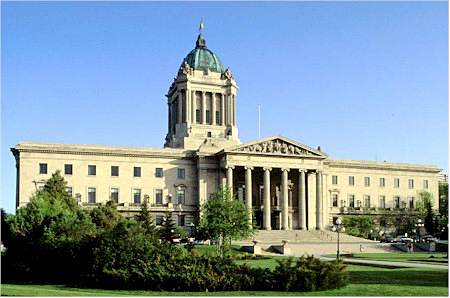 At the conclusion of her remarks, the honourable Official Opposition House Leader moved THAT this House find the government in contempt and that the Minister of Finance and the Minister responsible for Manitoba Hydro and the Premier of Manitoba be censured for first withholding information, then providing contradictory information and deliberately attempting to mislead this House by maintaining the cost of Bipole III was $2.2 billion for at least 18 months even though they were aware of contradictory evidence about the true and escalating cost of Bipole III, and as recently as yesterday continued to bring conflicting information to this House. In his ruling, Hickes makes the following comments about what must happen to find house privilege was violated and/or a minister/ government is in contempt. “The ruling of previous Manitoba Speakers have been very clear and consistent. Speakers Walding, Phillips, Rocan and Dacquay have all ruled that in order to find allegations of deliberately–of deliberate misleading the House as prima facie means proving that the member purposely intended to mislead the House by making statements with the knowledge that these statements would mislead. Therefore, a burden of proof exists that goes beyond speculation, conjecture, but involves providing absolute proof, including a statement of intent by the member involved, that the stated goal is to intentionally mislead the House, as it is possible members may inadvertently mislead the House by unknowingly putting incorrect information on the record. As I advised the House on April 16th of 2007, providing information that may show the facts are at variance is not the same as providing proof of intent to mislead. Speaker Dacquay also ruled that without a member admitting in the House that he or she had the stated goal of misleading the House when putting remarks on the record, it is virtually impossible to prove that a member had deliberately intended to mislead the House. It is virtually impossible to prove anything to an absolute certainty, and the Crown is not required to do so. Such a standard would be impossibly high. However, the standard of proof beyond a reasonable doubt falls much closer to absolute certainty than to probable guilt. You must not find NOA guilty unless you are sure s/he is guilty. Even if you believe that NOA is probably guilty or likely guilty, that is not sufficient. In those circumstances, you must give the benefit of the doubt to NOA and find him/her not guilty because the Crown has failed to satisfy you of his/her guilt beyond a reasonable doubt.